These automatic laminating machines are mainly use for laminating corrugated cardboard, paperboard and color printing face paper. This paper or solid board laminating machine is suitable for laminating cardboard whose bottom is more than 300G/m2. Meanwhile, this corrugated board laminating machine can laminate the paperboard into A/B/C/D/E flute corrugated cardboard and laminate corrugated board. This corrugated board laminating machine can be applied to food and drink, home electronic equipment, light industry, gift packing and other industries. 1. This laminating machine is equipped with automatic feeding for top sheet and bottom sheet. 2. Automatic control system is benefit for easy operation and trouble shot of paper or solid board laminating machine during production. 3. Most components of automatic laminating machines, such as bearing, electrical parts are from famous brands. 4. 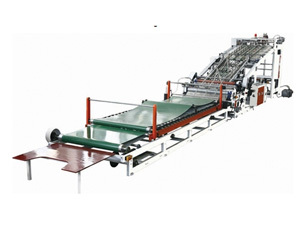 The lamination registering of corrugated board laminating machine is accurate. The bottom sheet does not exceed the top one. As a professional supplier of corrugated board laminating machine in CHINA, Shanghai Pripack Machinery Co., Ltd. has continually focused on providing a wide variety of paper processing, printing and packaging machinery for customers, such as paper cutter (A4 copy paper cutter wrapper/A4 paper cutting packaging machine), can printing machine (metal plate printing machine), flexographic press, hot foil stamping machine, die cutting, folder gluer, etc. With high quality assurance, our paper or solid board automatic laminating machines are popular in markets including Ukraine, Russia period, Chile, Brazil, Argentina, Mexico, Malawi, Pakistan, South Africa, to name a few.